Nexus 7 2013 vs. Nexus 7: What's Changed? If you have a first-generation Nexus 7, you're probably wondering if the next generation of Nexus 7 is worth upgrading to. Are the improvements that significant? Though the first-generation Nexus 7 was physically attractive and portable, the new Nexus 7 is definitely nicer to look at and to carry around. The device has gotten thinner and lost some weight. It measures in at 8.7mm thick, as opposed to 10.5mm thick, and it weighs 10.23 ounces or 10.55 ounces, depending on the model you select (Wi-Fi-only or LTE), rather than the 11.99 ounces that the lighter model of the first generation weighed. The Nexus 7 has also gotten 6mm narrower and 1.5mm taller, so it has a slightly different shape. Rather than the rubber back that the first-generation Nexus 7 sported, the new version has an entirely plastic exterior, with a black matte finish. Some users may miss the texture of the old version, but the new version has a cleaner look, given that it doesn't have the dimples in the back that the first version had. The main selling point for the new Nexus 7 is its improved display. The tablet offers a full HD display made out of Gorilla Glass, at 1920 x 1200 pixels with 323 ppi. Compare this with the resolution of 1,280 x 800 pixels and 216 ppi that the first-generation device has. The new Nexus 7 currently offers the sharpest display of all tablets on the market. The color and contrast were also improved from the first-generation Nexus 7. The difference between the two devices can easily be discerned if the devices are viewed side-by-side. Other than the fact that video playback is a complete pleasure on the new Nexus 7; it is improved from the first-generation device in many other hardware aspects. There are models available with both 16GB and 32GB of internal storage. The older Nexus 7 only offered 8GB or 16GB models. The older device did not have a rear camera, which many tablet users currently expect. The new device has a 5-megapixel rear camera, along with the same 1.2-megapixel camera that the first generation has. It can capture video in 1080p, while the older Nexus 7 could only capture video in 720p using the front-facing camera. 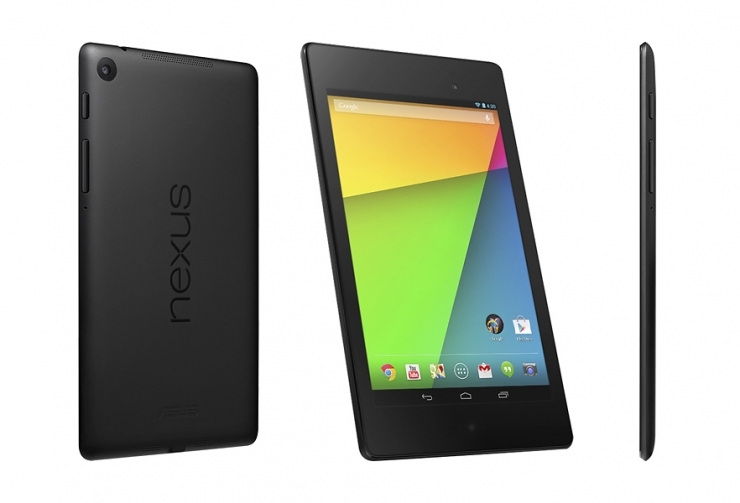 The newer Nexus 7 has a Snapdragon S4 Pro quad-core processor, with a clock speed of 1.5GHz. The older model has a Cortex A9 quad-core processor, clocking in at 1.2GHz. The newer model also has an additional GB of RAM, giving it 2 GB of RAM, and it also comes with Android 4.3 Jelly Bean. Some additional features include support for wireless charging, Bluetooth 4.0, and Android 4.3, all of which the first generation lacks, though the first generation can be upgraded to Android 4.3. The new Nexus 7 offers an astonishing display, a faster processor, more RAM, and a sleeker look overall. It also shares the low price tag that the first-generation possessed, so it’s certainly worth the upgrade, even just for the display alone.